1. 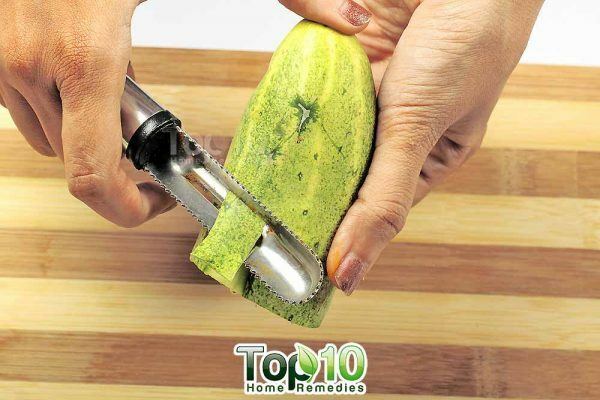 Peel 1/2 of a cucumber. 3. 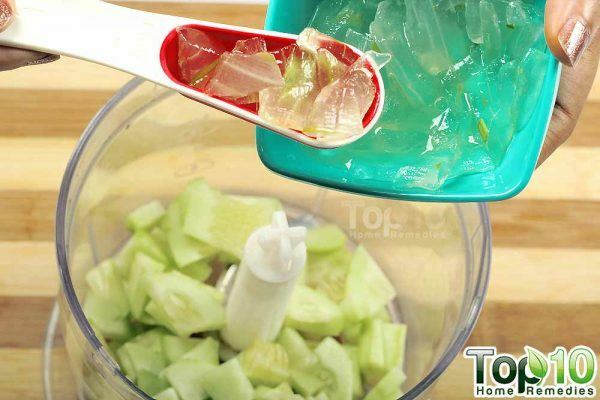 Toss the cucumber chunks into a blender. 4. 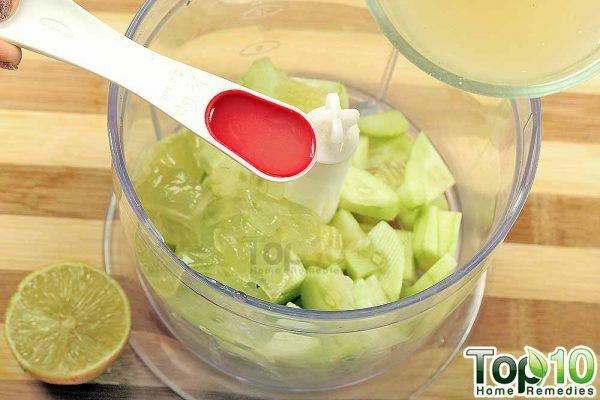 Add 2 tablespoons of fresh aloe vera gel. 5. 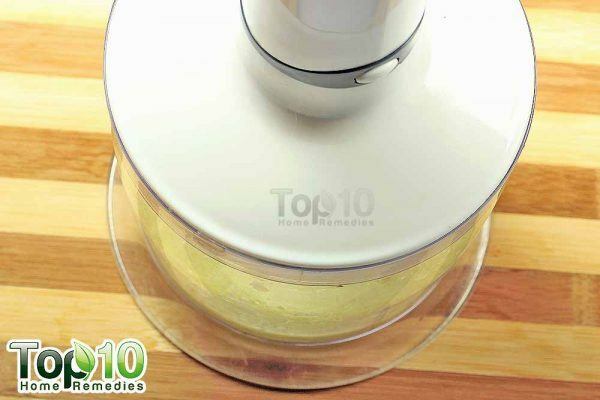 Add 1/2 teaspoon of freshly squeezed lemon juice. 6. 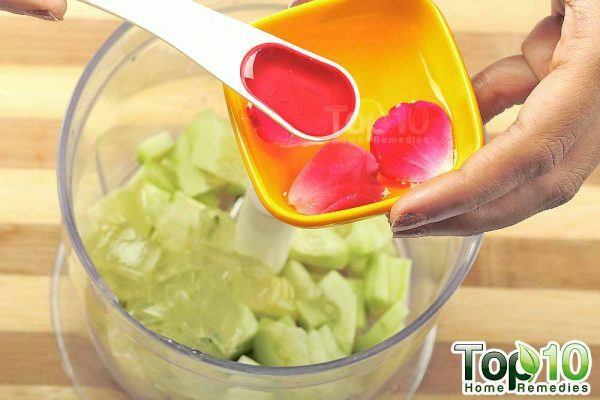 Add 1/2 teaspoon of pure rose water. 7. Blend the mixture for a couple of minutes. 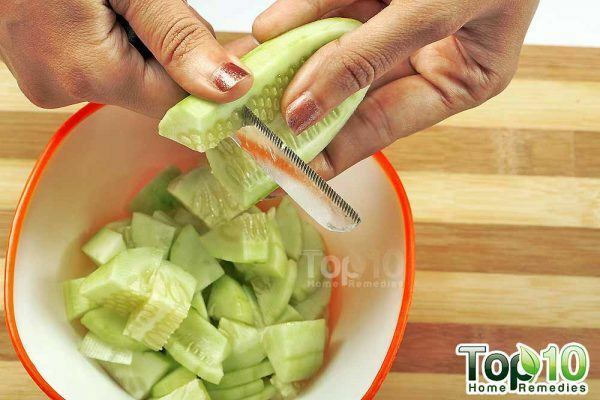 Cucumbers have high water content and aid in keeping the skin hydrated. 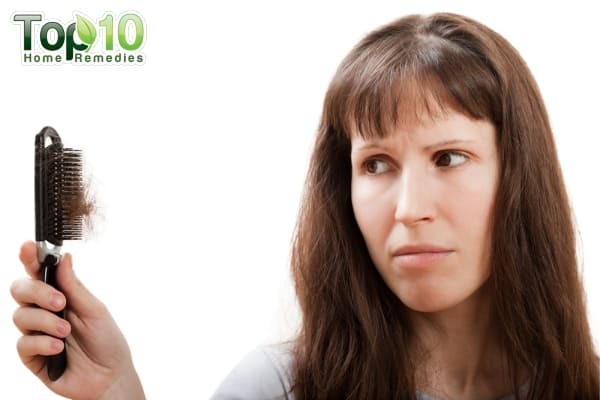 Being an astringent, it also helps tighten the skin. This fruit is a good source of vitamin C and other antioxidants that help maintain clear, glowing, and young-looking skin. Also, it is good for reducing dark circles under the eyes. 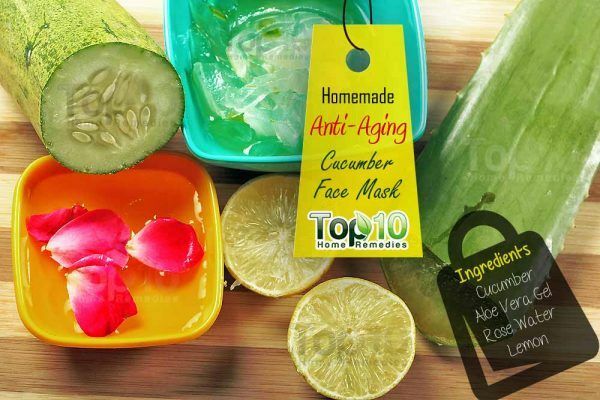 This anti-aging cucumber face mask also contains aloe vera, lemon juice, and rose water. Lemon juice and rose water are incredible for your skin due to their antioxidant and skin-tightening properties. (5) They also help fade blemishes, reduce age spots, minimize large pores, and add a youthful glow to your skin. The wonderful smell of rose water has a calming and relaxing effect and can be useful in reducing stress. Your homemade anti-aging cucumber face mask is now ready for use. Wash your face and neck, and pat dry. Apply this beauty mask on your face and neck. Rinse it off and then splash cold water on your face. Do this once or twice a week on a regular basis. Do not forget to apply a moisturizer. 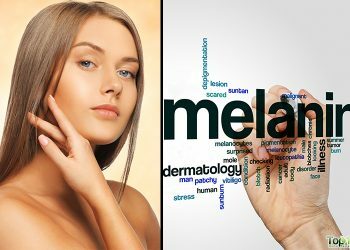 Choose one that’s suitable for your skin type. Note: This face mask may not be suitable for those with sensitive skin due to its astringent quality. 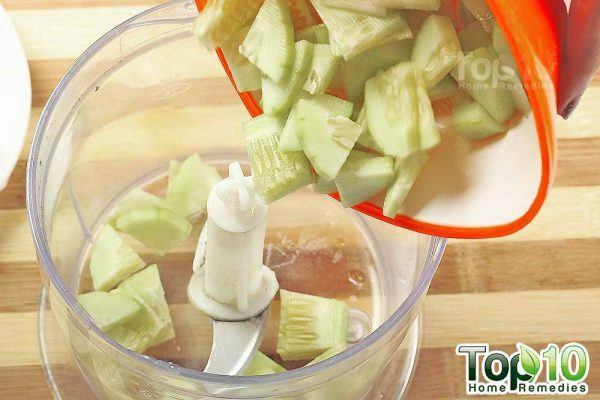 Instead of a blender, you can use a fork to mash the cucumber chunks. Use fresh aloe vera gel extracted from an aloe leaf. You can find the steps here. Add one teaspoon of organic honey in this recipe to make the mask more moisturizing. 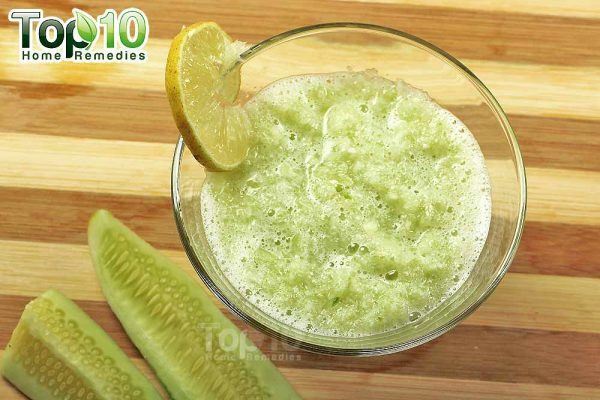 Eat refreshing and hydrating cucumbers to maintain a healthy and young-looking skin. Korean researchers found that taking aloe vera gel internally can also help reduce wrinkles and improve skin elasticity. You can consume as little as 1/4 teaspoon of the gel daily for a few months. Do not take it in excess, though, because it has a laxative effect. Fiume MM, Bergfeld WF, Belsito DV, et al. Safety Assessment of Cucumissativus (Cucumber)-Derived Ingredients as Used in Cosmetics. International Journal of Toxicology. https://www.ncbi.nlm.nih.gov/pubmed/24861368. Published May 2014. Ivana, Lazarevic, Viktor, et al. 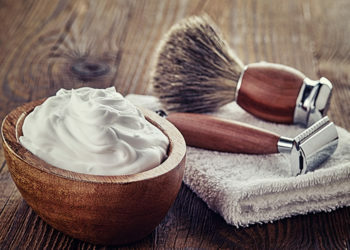 Skin Ageing: Natural Weapons and Strategies. Evidence-Based Complementary and Alternative Medicine. https://www.hindawi.com/journals/ecam/2013/827248/. Published January 29, 2013. Cho S, Lee S, Lee M-J, et al. Dietary Aloe Vera Supplementation Improves Facial Wrinkles. Annals of Dermatology. https://www.ncbi.nlm.nih.gov/pmc/articles/PMC2883372/. Published February 2009. Smit N, Vicanova J, Pavel S. The Hunt for Natural Skin Whitening Agents. International Journal of Molecular Sciences. 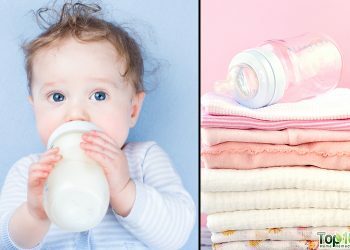 https://www.mdpi.com/1422-0067/10/12/5326. Published December 10, 2009. Hili P, Naughton DP, Thring TSA. Antioxidant and potential anti-inflammatory activity of extracts and formulations of white tea, rose, and witch hazel on primary human dermal fibroblast cells. Journal of Inflammation. 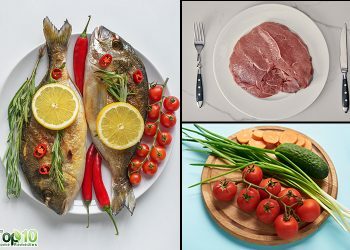 https://journal-inflammation.biomedcentral.com/articles/10.1186/1476-9255-8-27. Published October 13, 2011.
where to get rose water? indians spice shop is where u will get rose water. You can make rose water. You’ll need Rose petals, a cooking pot small bowl heat proof, metal stand or anything to elevate the bowl. On the pot place the bowl in the middle. Place tge rose petals around the bowl. Pour distilled water on the pot soaking the petals. Cover the pot. Cover must be inverted. Let it boil. The steam will pour to the bowl. That will be your ROSE WATER. Thanks for the tips. Pls where can I get the rose water? Where do you get rose petals? To make rose water, boil rose petals in distilled water. For how much time is the pack to be applied. I would know to get my face fair.